Legend has it that MJ wore his college team's shorts underneath his pro kit for good luck. The Jordan DNA Distorted Basketball Shorts pay homage to this unique superstition with a mash-up design inspired by both teams. Legend has it that MJ wore his college team&apos;s shorts underneath his pro kit for good luck. 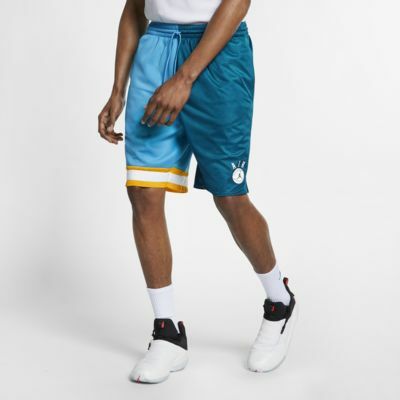 The Jordan DNA Distorted Basketball Shorts pay homage to this unique superstition with a mash-up design inspired by both teams. The design combines inspiration from MJ&apos;s pro and college kits. Knit fabric is made to move with you. An elastic drawcord waistband gives you a comfortable, personalised fit. Fabric: Body: 100% polyester. Mesh lining: 100% recycled polyester. Have your say. Be the first to review the Jordan DNA Distorted.